I am one happy runner writing this week’s recap. 13 weeks down, 3 weeks to go. Not only did I survived the toughest week of marathon training… I made it to taper! I LOVE taper time! A few longer workdays, a baby shower invite for Saturday along with more snow in the forecast made this week’s training a little tricky. I knew I would have to do my long run on Friday if I wanted to go to the baby shower on Saturday so I got my 3x1 mile treadmill workout over with on Monday instead of my usual Workout Wednesday. 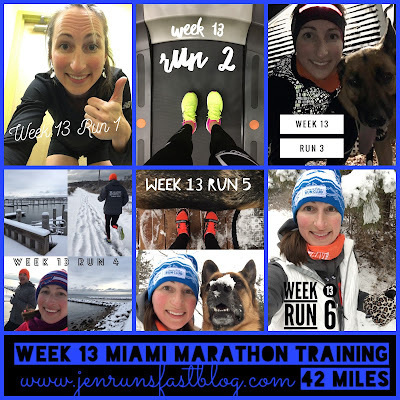 Last week I had 4 one mile repeats and I ran them at 8.5, 8.8, 9.0 and 9.3 mph. This week I only had 3 so I went for them all at 9.0 mph. I felt awesome. And I was pretty pumped up watching the Rose Bowl pregame show on ESPN during the last few miles. WE ARE! I took Tuesday off and returned to the treadmill on Wednesday. I went back and forth about running 8 or 10 miles so I ended up with 8 miles on the treadmill then I grabbed G for another 2 miles outside. Have I ever mentioned how much I love night running with her?! Friday was… fun? My friend Steve (THE Steve Infascelli) asked if I wanted to run not knowing I had 22 miles on the schedule. He agreed to run about 8 of the middle miles with me and I would meet up with him around mile 8. We knew it was going to snow Thursday night into Friday morning but we definitely didn’t expect the amount of snow as we actually got. The original plan was I’d start running from my parents’ house around 10am but the roads to Falmouth were horrible so I procrastinated a bit in the morning and pushed the start time back to about 10:45am. It was still snowing when I started running and was about ankle deep in snow if I ran on the sidewalks or a mixture of snow, ice, slush if I ran on the roads. I felt like I was putting in a lot of effort to lift my legs and kept switching from sidewalk to the roads then back to the sidewalk again. I knew from the beginning it was going to be a long and slow epic adventure but I didn’t realize how hard it was going to be. In my mind I broke up my run into 3 parts—8 miles alone, 8 miles with Steve, then 6 miles to the finish. I knew if I could get to Steve I would be fine until at least mile 16 and I started debating the difference between 16 miles in the snow vs. a normal 22 miles. I made a few stops to capture the route’s beauty along the way because it truly was gorgeous. The weather was also better than I expected—not too cold, hardly any wind. I started getting in my groove and picked up the pace so I was between 8:00 and 8:15s. I’m pretty sure mile 7 was my fastest mile of the day. I was looking forward to having company and really wanted water! I didn’t carry any with me and I was surprised at how thirsty this run made me. Maybe it was the humidity? I saw Steve’s car in one of the Surf Drive Beach lots and we were going to run to Woods Hole and back. I’m pretty sure it was my brilliant idea to take the nice and flat bike path down. Yeah, the *unplowed* nice and flat bike path. The further we went, the deeper the snow got. I was struggling. Once we got to Woods Hole, we looped around and followed the Falmouth Road Race course back to his car. Yeah, the hilly and windy roads of the Falmouth Road Race course. I continued to struggle. By now the snow had melted on the roads and we were left with some slush. My mom drove by us on her way home from work and I got some more water. I thought about stopping at mile 16 with Steve but I thought I could maybe make it to 18. I took off my YakTrax and traded in for a warm hat and continued. I was so thankful Steve offered to stay with me until I decided to stop. I would pick a spot about a mile ahead and he would drive there and wait for me. I saw him just before 18 and wasn’t ready to give up just yet. I knew I wouldn’t make it to 22 but I was going to try for 20. Mile 19 was still ok but mile 20, holy crap! I turn a turn onto Maravista and was going straight into a strong headwind—the first wind I noticed all day! It was also shady and I was getting cold. When my watch beeped for 20 miles, I jumped into Steve’s car and he drove me back to my parents’ house. My total moving time was 2:43:59 or 8:12 pace. Not bad considering my splits for the first 2 miles were 8:42 and 8:43. 18 miles on a treadmill a few weeks ago and 20 miles in the snow. Miami, I’m ready for you. I ended the run week on Saturday. We had a lot more snow coming so I got out pretty early with Georgie. I ran 3 with her then 3 on my own. It was pretty slow. More snow. More ice. We were anticipating Blizzard conditions and with over a foot of snow, I never made it to the baby shower. Ahhhh… taper. With a side of #NormaTecAndChill. 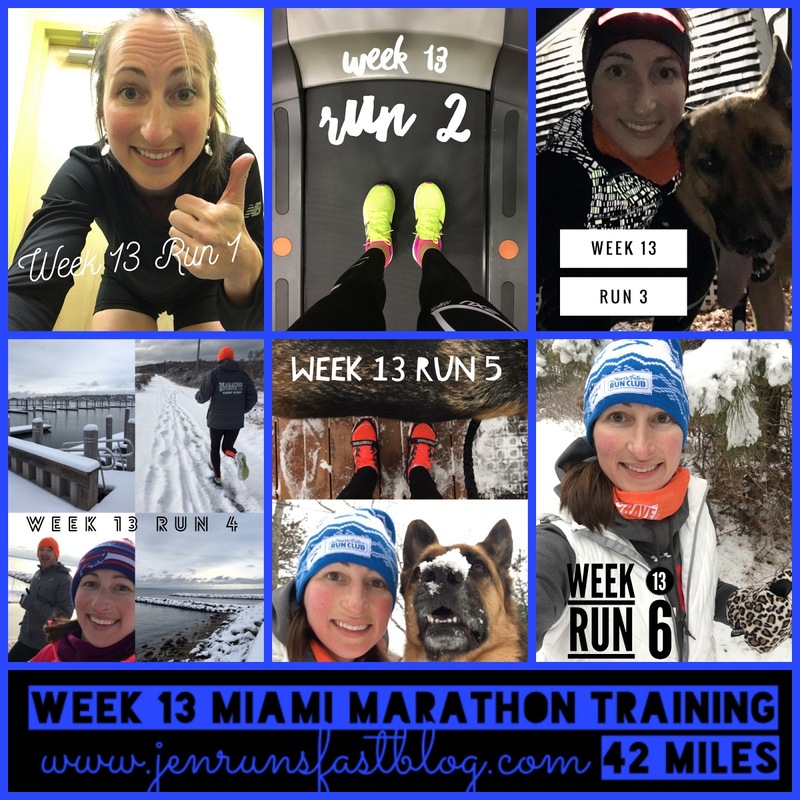 · 3 weeks until the Miami Marathon! 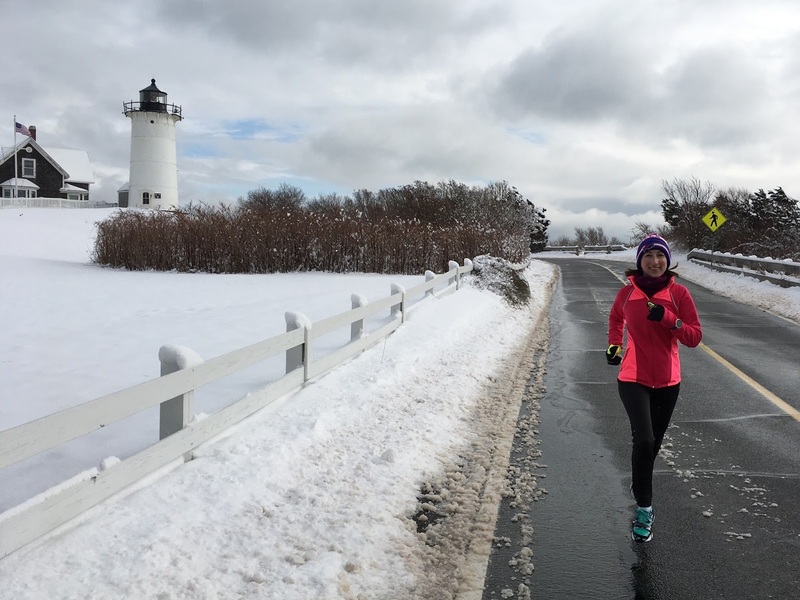 · 14 weeks until the Newport Rhode Race! Wow! Impressive week and really fast time running in that snow! And for 20 miles?? Great job!! Thanks Gina!! It was quite an adventure!